Now it's a Concentrated Energy Powder! Many people use some form of stimulant to get them going in the morning or keep them going in the afternoon. Most usually, this is a cup of coffee from the local coffee shop. Even a small cup of coffee is around $4.00 dollars a cup. Coffee can often give you jitters, not to mention digestive problems to go along with those jitters. 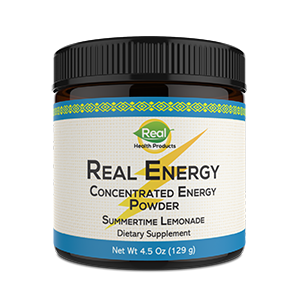 With Real Energy, you can get 30 servings at approximately $1.25 dollars a cup. It's a safe and effective solution to being bright and alert (without any jitters) and having all the energy you need for the whole day, and without the same kind of digestive problems that coffee can give you. So, 4.00 dollars a cup for coffee, multipled by 30 days, equals $120.00 dollars a month. Real Energy is only $37.50 dollars a bottle, which should last you 30 days. You can order right now, and try it for yourself! Order the RHP® Real Energy Now! Provides far greater energy boost than ordinary energy drinks and lasts up to 5+ hours. The problem with most energy drinks is they create a short spike of energy and then they drop you off a cliff leaving you feeling more tired than when you started. RHP® Real Energy will keep you going! ✓ NO letdown! NO tiredness! RHP® Real Energy - How does it work? RHP® Real Energy's natural energy boosting ingredients were formulated not just to pull from the existing energy reserves of the body (as most other energy products do), but to support the body's natural energy production at the cellular level. This leaves you with an abundance of energy as well as heightened awareness, with no energy crash afterwards. Who Needs RHP® Real Energy? RHP® Real Energy comes in a convenient 4.5 ounce jar which provides 30 servings. You simply mix 1 scoop (4.3 g) with 6 to 10 ounces of water to taste and it tastes like scrumptious summertime lemonade! The caffeine in RHP® Real Energy is extracted from green tea leaves. Green tea has been used as a natural and safe stimulant for hundreds of years. Acetyl-L-Carnitine is an amino acid (a building block for proteins) that is naturally produced in the body. It helps the body produce energy at the cellular level. One of the main roles of Acetyl-L-Carnitine is to carry fatty acids from the main body of the cell into the energy-producing furnace within the cell so that these fats can be burned for energy. D-Ribose supports your body's core energy and helps keep it charged. Though your body produces ribose naturally, it does so slowly. Evidence indicates supplementing with ribose helps to restore and maintain your body's energy reserves. While using RHP ® Real Energy, your energy level will not go below the base line from where you started and it won't result in a hypoglycemic (tiredness) effect (sugars in other energy drinks cause this effect). RHP® Real Energy has a delicious and refreshing natural lemonade flavor. RHP® Real Energy is the only natural energy drink available that uses this unique nutrient combination. This unique nutrient combination supports the effective use of the body's stored energy, while at the same time it helps build the body's ability to actually generate new energy! RHP® Real Energy is 100% natural and safe. It comes in a convenient 4.5 ounce jar. There are 30 servings in each jar and it has a natural lemonade flavor. A jar of RHP ® Real Energy is $37.50 and should last around a month. We're so sure about the effectiveness of RHP® Real Energy, that we offer a 90-day money-back guarantee on your initial order! 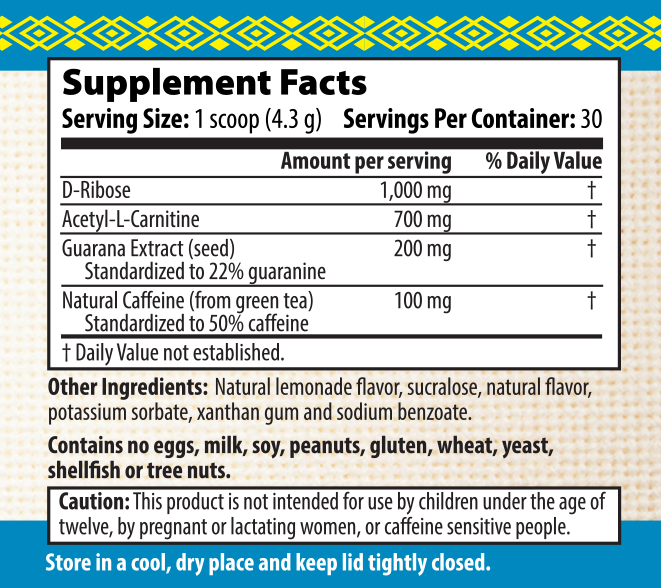 Caution: This product is not intended for use by children under the age of twelve, pregnant or lactating women, or caffeine sensitive people.